You may already know that your home has a hard water problem, but you may not realize all of the ways hard water could be affecting you and your family. Hard water can lead to hard water scale build-up in your pipes and appliances, leading to potential maintenance problems. Hard water can also dry out your skin, dull your hair and affect your laundry. A Culligan® water softener system can transform your home’s water from the shower to your laundry room and reduce the problems associated with hard water. Not only will you see noticeable changes to the quality of your water, but you may also notice big savings on your bills. 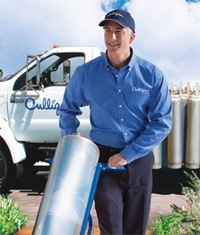 Your local Culligan Man simply delivers and exchanges a soft water exchange tank at your home on a regular schedule. Regeneration takes place at Culligan, so there’s no salt or discharge at your home at all. Culligan’s High Efficiency Water Softener is our premiere softener offering you all the benefits of a traditional softener with additional features and efficiencies designed to save you time and money. Culligan has applied our innovative and patented technologies to give you features including customizable water softness settings. Most importantly the Culligan HE Water Softener will save you money on your water and energy bills while decreasing your home’s impact on the environment. As always, Culligan water systems are third-party certified to perform as promised and are backed by one of the most comprehensive warranties in the industry. To learn more about Culligan® Water Softener Systems or sign-up for a FREE water analysis, click here. The Culligan Gold Series Water Softener is designed to put an end to all of your hard water problems. From soap scum and scaling to dried out skin and dull laundry, the Gold Series Water Softener can handle the toughest hard water. A Culligan Water Softener allows your local Culligan Man to create a customized solution that is unique to your home and your home's water. Give us a call today to discuss if a Gold Series Water Softener is right for you. An easy solution to soft water, Culligan water softening systems operate just as efficiently using potassium chloride as an alternative. Your local Culligan dealer has a full line of salt-free filtration systems that don’t use salt, including: Cullar® Carbon Filter, Filter-Cleer, Sulfur-Cleer® and Cullneu Neutralizing Filter. You may not be familiar with these options but Culligan welcomes the opportunity to explain all of their benefits at your convenience.